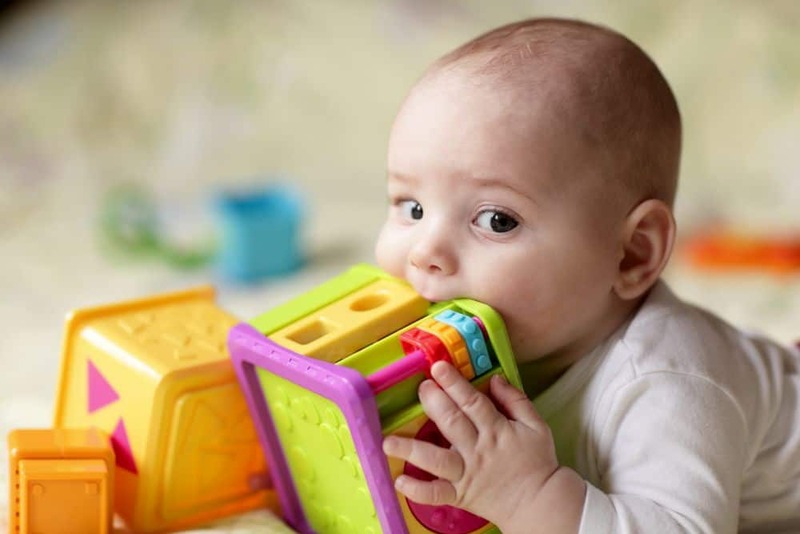 Are you looking at your baby’s toys and wondering how they got so grubby? You know they need to be cleaned, but where do you start? What do you use and how often should you clean baby toys? Luckily for me, my child’s favorite toy was a soft-bodied baby doll. It was machine washable, so when I could get away with it, I would sneak it away and pop it through the machine and dryer while she was asleep. Voila — one nice, clean doll. It’s not always that easy though. Let’s look at why we need to clean baby toys, the different materials toys are made from, and the best way to clean them. Why Should You Clean Baby Toys? Babies love playing with toys, but just think about what they do with them. They throw them around the floor, drool on them, spit up on them and, after all this, put them in their mouths. These toys may harbor germs, which could make your baby sick. This is especially the case if another family member has been ill recently and handled the toy. Or you might have had a playdate where other babies have played with the toys and left germs behind. Regular cleaning of baby toys is essential to make sure bacteria can’t take hold. This is especially the case with soft toys, like teddies and spongy toys (source). Different toys will present different challenges when it comes to cleaning and disinfecting them. Let’s explore some of these in more detail. Fabric toys can get dirty quickly, and end up housing nasty germs. Check the label on the toy to help you decide which is the best way to clean them. Some will go through the laundry and others won’t. If you notice your baby spit up on a teddy, clean it right away with a damp cloth and a mild soap solution. If they are machine-washable, make sure you use a gentle detergent that’s suitable for babies. You could add a cup of vinegar to help deal with bacteria (source). For the toys that can’t be laundered, lightly hand wash in mild soap and then air dry in the sun. As with machine washing, disinfect them regularly. Bathtime is fun for baby but they inevitably pee in the bath water, and you pray that’s where it stops. Then there is the dust and grime you wash off their little bodies. Those plastic ducks and other toys are swimming around in all that. You get the picture. This is a perfect breeding ground for nasty microbes and mold. These toys need to be washed and dried every time they’re used (source). Wash them after every bath and hang them to dry in a net bag, or an open basket that allows the water to drain out. You could also dip them in a bleach solution at a ratio of 1.5 teaspoons of bleach per gallon of water to disinfect them (source). These are the hardest baby toys to clean, in my opinion. My child had a few bath toys that I eventually threw away because my best efforts to clean them failed. Remember, when in doubt, throw it out — your baby’s safety is more important than saving an inexpensive bath toy. Plastic toys are a favorite with all babies. They come in many shapes and sizes, from a simple rattle to a battery-powered toy with lights and sounds. Some simple plastic toys are dishwasher safe, which is a good way to clean them. Otherwise, wipe them down daily with some hot water and dish detergent. If it’s a toy with a battery compartment, remove the batteries before wiping them down. Use an old, dry toothbrush to clean the battery compartment. Soft and squishy, these toys are light and flexible for baby to play with. They can be easily handled, but also pick up a fair amount of germs. These materials cannot be boiled, as heat changes their texture. They should be wiped down with a 1:1 mixture of vinegar and water, left for a few minutes, then rinsed and air dried (source). They can also be cleaned by soaking them in warm soapy water with some added baby shampoo or mild detergent or disinfectant. After about 30 minutes, rinse them in clean water and pop them in the dish rack to dry. Natural wood is the choice for some building blocks, train sets, rocking horses, and other toys. Some wood has little grooves, where dust and germs might collect. Cleaning toys made from wood requires some care. You don’t want to get the wood too wet, as it can warp as it dries out. Use a damp cloth with the 50/50 vinegar solution we mentioned above. Use a soft brush to remove any dirt from grooves. These can be tricky ones to clean unless, like mine, you can launder them. There are many different materials which might need different types of cleaning. Plastic bodies can be wiped down with detergent and warm water, as above. Hair can be washed with baby shampoo — your child will think it’s a fun activity, washing their doll’s hair. Fabric can also be washed with warm water and baby shampoo and allowed to dry out completely. Toys need to be cleaned when you can see they’re getting dirty. But even if they look good, you should clean them at least once a week and disinfected once a month. However, if your baby or others have been sick, if other children have been playing with them, or the fur baby has licked them, disinfect them immediately. This will kill off germs and bacteria that normal soap and water won’t get rid of. That way you can reduce the risk of your baby or other family members being reinfected. You can use the bleach solution mentioned above to disinfect baby toys. But remember to clean baby toys with soap and water first to remove dirt and dust, then wipe over with the disinfectant (source). With everything else you have to do when you have a young family, cleaning toys might drop under the radar. However, it’s important you know how to clean toys and how often to do so. Your baby is going to be exposed to some germs, which is fine, as it helps them build immunity (source). There are times, though, especially after an illness, when cleaning toys is necessary. We hope you enjoyed our guide to cleaning baby toys and picked up some helpful tips. Please leave us a comment with your insights and experiences. If you know other moms who will benefit from learning how to clean toys, please share.